October 2015 - The Roemheld Modulog assembly and handling system brings safe, ergonomic and secure hand assembly to automotive workstations and green button cells. Various linear and rotary modules, some with integrated media ducts, are easily operated via either a small command module or foot or hand switches. October 2015 - Our latest 5-Axis technologies and our tried and tested zero point mounting systems generated a lot of interest at the recent SECO event. We also exhibited our competitively priced pallet vice range and the benefits of our SPEEDY classic zero point mounting system that offers rapid and repeatable changeovers and ease of use across a wide range of workholding applications. 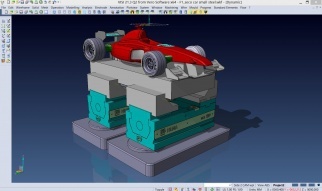 October 2015 - The very latest 5-Axis vice technology launches will be on display at Roemheld stand B10. The competitively priced pallet vice and the compact MC125, both designed to enable just 3mm of clamping height, will be launched at the show. 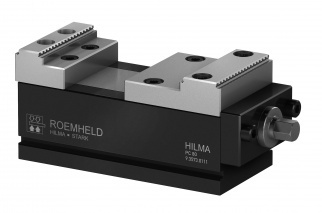 The new Roemheld PC 80 clamping pallet vice system offers high precision and process safety and is particularly suited for the manufacture of small and medium sized batches as well as for pallet magazines within automated systems. 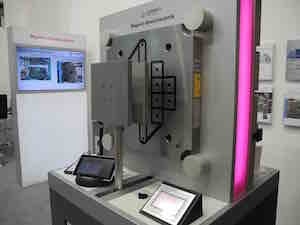 October 2015 - Roemheld’s tried and tested magnetic clamping technology enables die changing on automatic punching machines and presses to be carried out in minutes, thanks to clamping times of just two to three seconds. 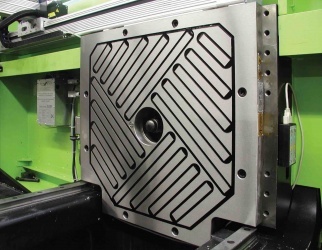 As a result, the M-TECS range is ideal for the decreasing small batch sizes and increasing variety of workpieces that the sheet metal and plastic processing industries need. 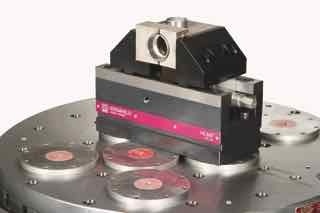 August 2015 - The Roemheld M-TECS 130 magnetic clamping system has outstanding power concentration that makes it stronger than any comparable magnetic plates. Stable up to 130 °C, the system has been designed specifically for the temperature range used within the thermoplastics processing industry. 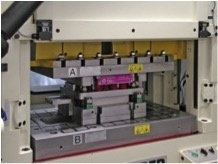 The secret of the power concentration of the M-TECS 130 magnetic clamping system lies in its long pole design, which is based on a double-magnet technique. Quick die change? we’ve an app for that! 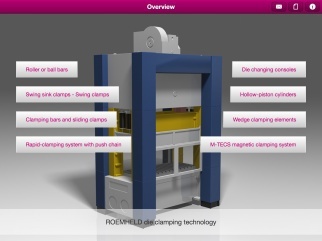 July 2015 - Roemheld has just launched an iPad app for its Hilma die clamping technology. The free app provides access to the extensive information on the wide range of products and solutions available from Roemheld for sheet metal forming and magnetic clamping applications. 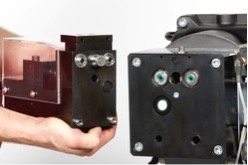 May 2015 - Roemheld has just launched a new pallet vice system that offers a simple, compact design at an economical price. The new Roemheld PC 80 clamping systems offer high precision and process safety. The vices are particularly suited for the manufacture of small and medium sized batches and can be used in pallet magazines within automated systems. 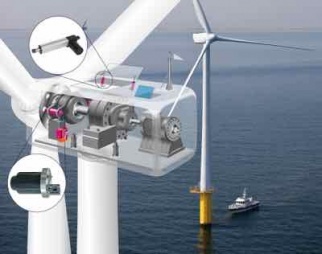 April 2015 - Roemheld will be exhibiting new rotor locks that are designed to deliver increased availability and simplified maintenance to wind power plants at All Energy 2015. Visitors to Roemheld stand no. M68 will be able to find out about how Roemheld offers components for the safe maintenance and locking of off-shore and on-shore wind power plants. February 2015 - From January 2015, Terry O’Neill has been appointed as the Managing Director of Roemheld (UK) Limited. 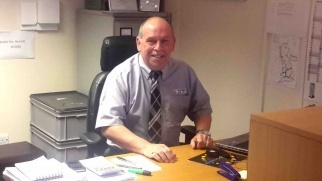 Formerly acting as joint Managing Director with Bill Neal, Terry has now taken over the role on a full-time basis. Bill Neal will continue in the role of Marketing Director for Roemheld (UK) until his retirement at the end of 2015. February 2015 - Roemheld has just launched a new 5-Axis vice designed to complete its range of 5-axis clamping components. The new, mechanically operated MC125 series combines a compact design with large clamping strokes making it ideal for use in 5-Axis clamping applications. January 2015 - To date, Roemheld offers the only magnetic clamping plates with a control system that meets the new EN 289 press standard for plastic and rubber machines that came into force in January 2014.